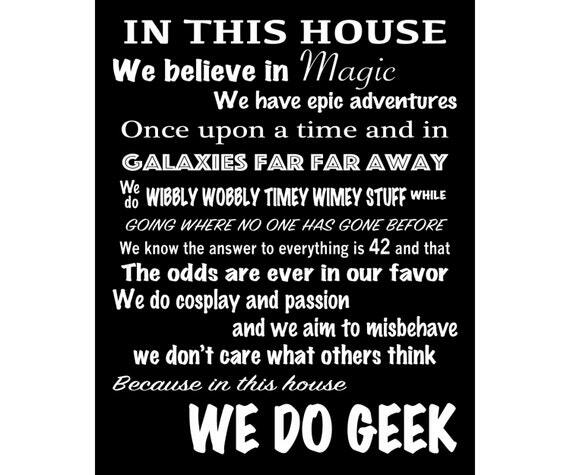 Geeks at heart will love these “In This House We Do Geek” signs and wall decals featuring a mixture of geeky one-liners from popular books, movies and TV shows including Disney, Harry Potter, Star Wars, The Hitchhiker’s Guide To The Galaxy, Star Trek and Lord of the Rings, just to name a few. 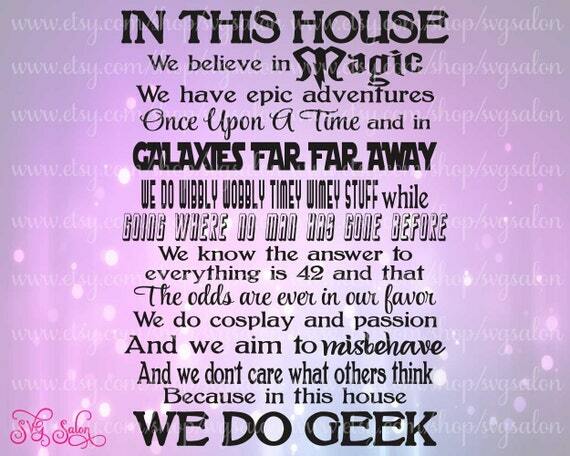 Below, you will find a collection of “In This House We Do Geek” fandom signs and wall decals that are available for sale from artisans on Etsy. The signs vary in price and come in a variety of different mediums including wood, canvas, photo paper, vinyl decals and do-it-yourself digital printables. 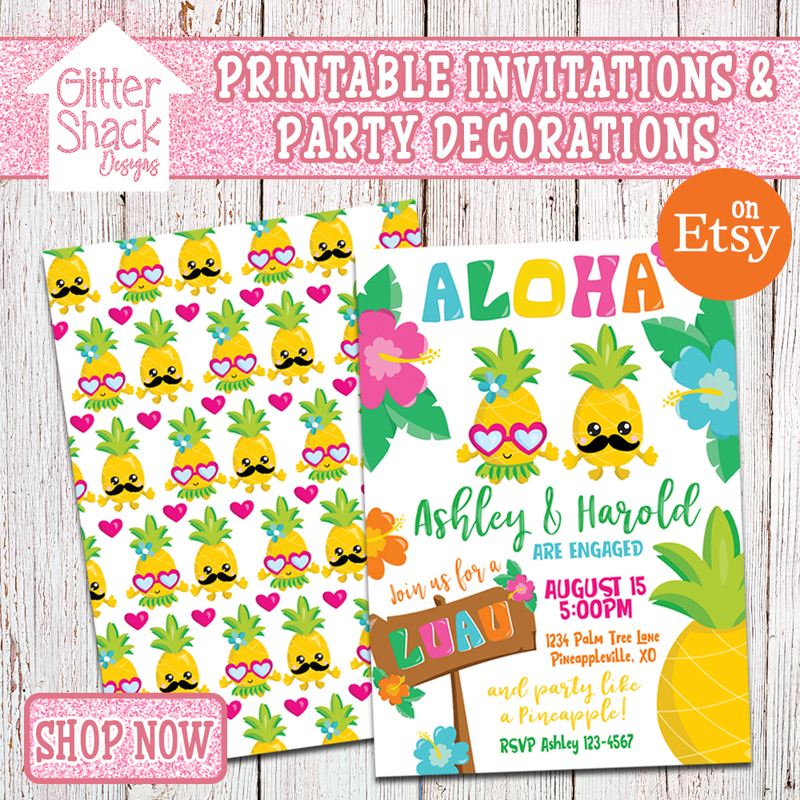 Digital printables are the most affordable option and as an added bonus, you receive the file ready for you to print immediately upon payment unless you choose to have it customized. 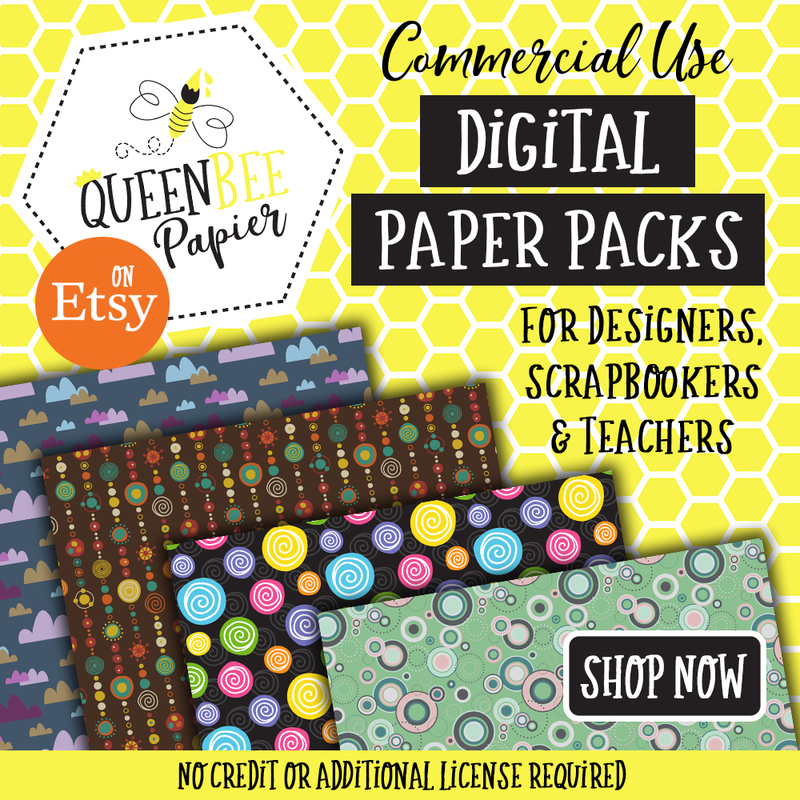 Custom orders on digital downloads are usually delivered within 24 to 48 hours. 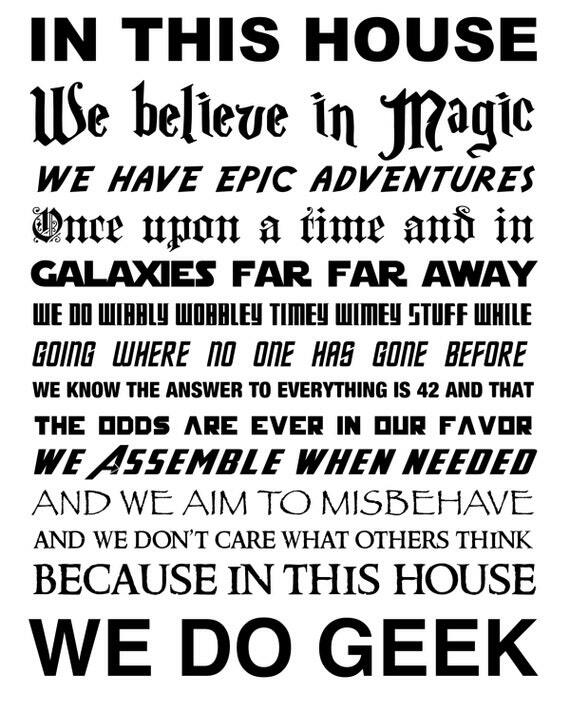 Here is a popular version of the “In This House We Do Geek” quote, although many designers put their own spin on the words. This 12 x 16 inch sign is made on 1/2 inch thick Birch wood. 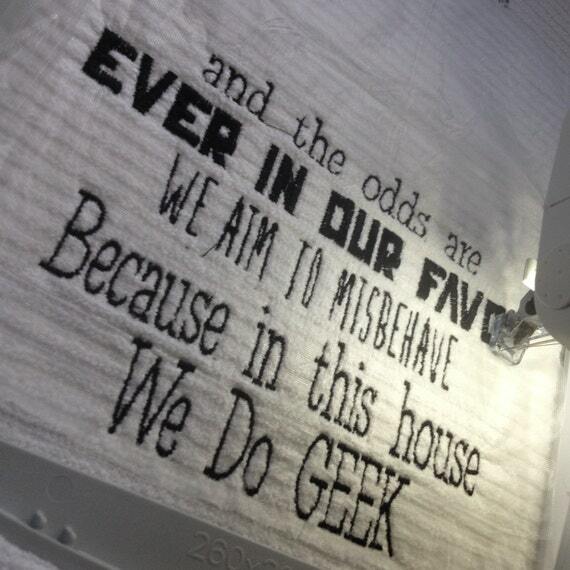 The sign is painted black with white vinyl lettering and comes with a keyhole in the back for hanging. This seller welcomes custom designs of you’d like to switch out a couple of lines. 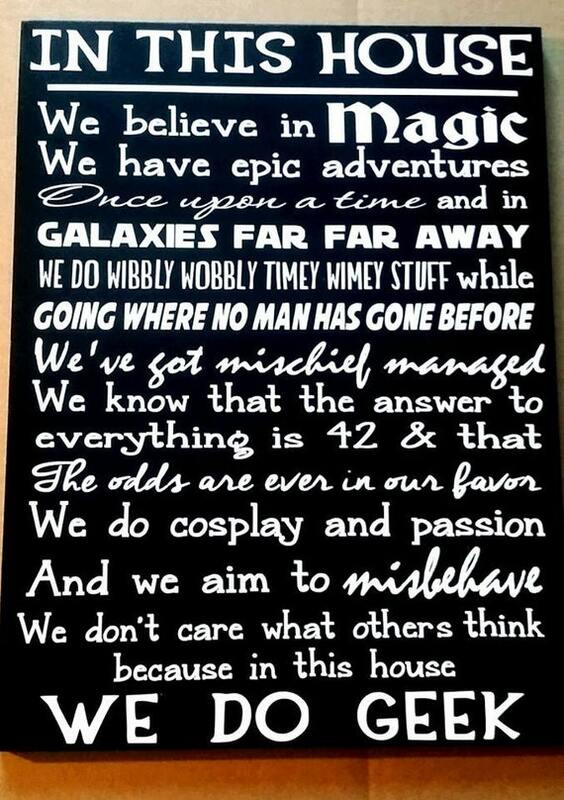 Here is an 11.25 x 24 inch wood sign that is perfect for decorating a family or recreation room. Choose your the color of your board and lettering from a variety of colors to match the decor of your room. It is ready to hang with a saw tooth hanger on the back. This sign comes in six different sizes ranging from 8 x 10 inches to 24 x 30 inches and are available on your choice of wrapped canvas or premium luster photo paper. Choose from 18 colors of white text on a colored background or the traditional black text on white. 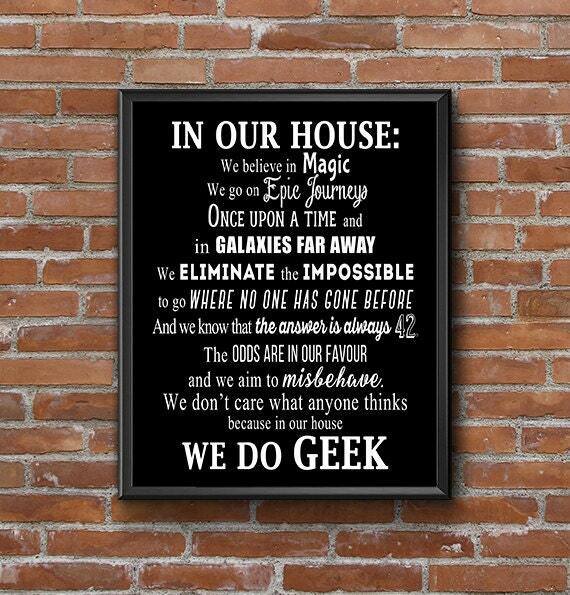 Add a blast of color and geekiness to your home with this bright, multi-colored 16 x 20 inch canvas wall art print. The sign features black text on a colorful background of blended colors including green, blue, purple, red, orange and yellow. 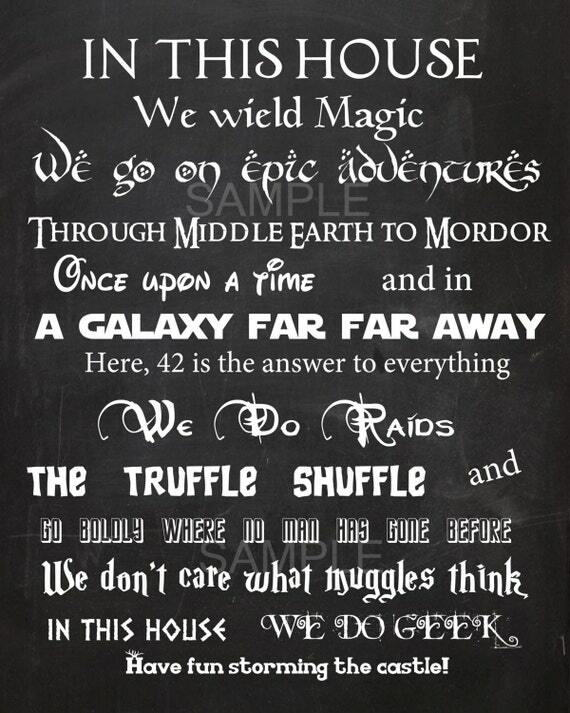 This chalkboard style sign is printed on photo paper, ranging in sizes from 8 x 10 inches to 24 x 36 inches. You also have the option of purchasing the digital file and printing it yourself at your local photo center. 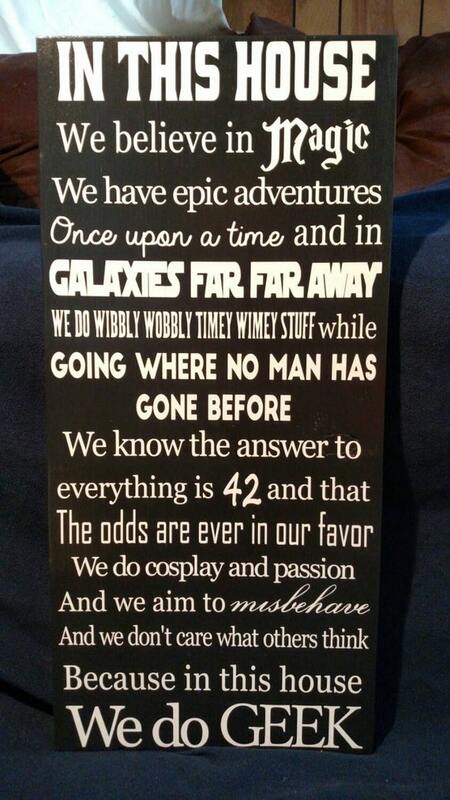 Fandoms will love this out of this world sign! Tise poster sign features white text on a galaxy background and is available in sizes ranging from 8 x 10 inches to 20 x 30 inches. The signs are printed on premium photo paper. 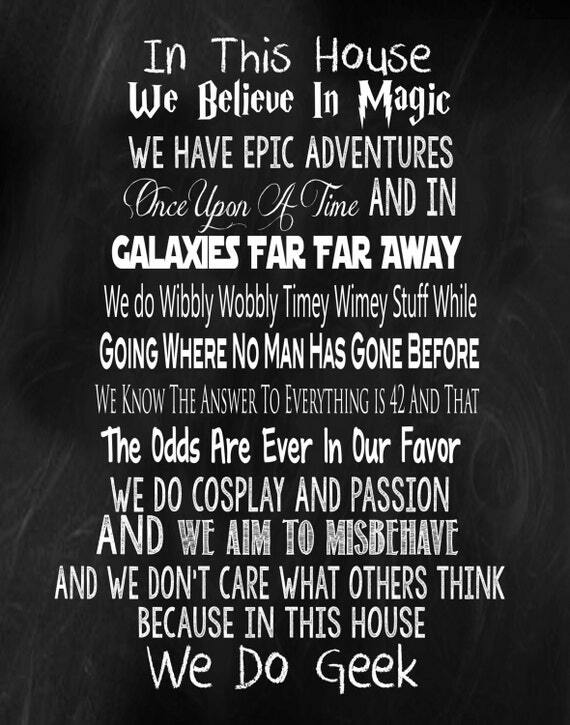 This modern, chalkboard style 16 x 20 inch poster print would look great hanging on the wall in any style of room. 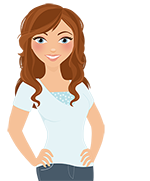 This graphic designer has a few different versions available in her shop and she welcomes custom requests. 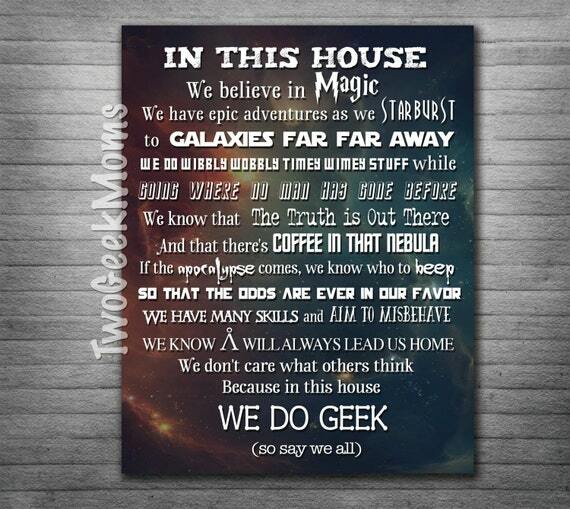 This 8 x 10 inch instant digital download is an inexpensive option for decorating your home with nerdy wall art on a budget. Print the file on your home printer or at a photo center and then mount it in a picture frame and hang on your wall. This fun and colorful printable sign is perfect for a decorating a nursery or child’s bedroom. The sign includes white, decorative text mixed with pops of colorful text on a black background for a playful and fun touch. This printable chalkboard signs comes in two sizes – 8 x 10 or 16 x 20 inches. 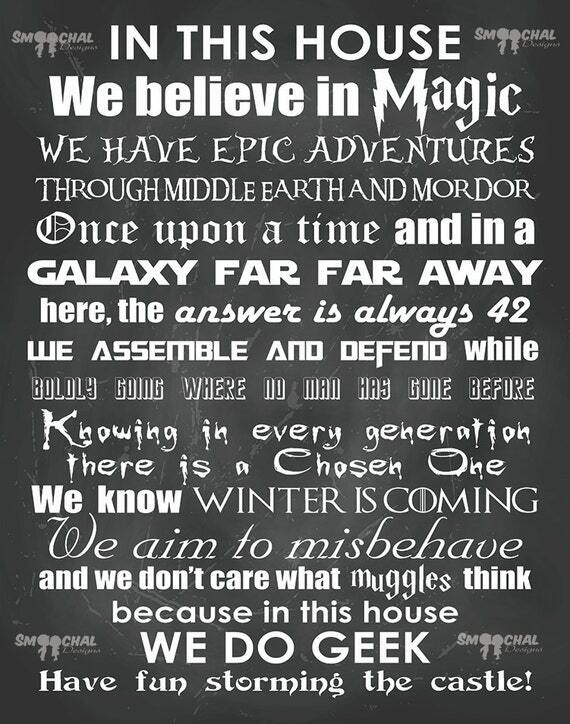 Print it a photo print shop and frame it to make nerdy wall art for decorating your home. 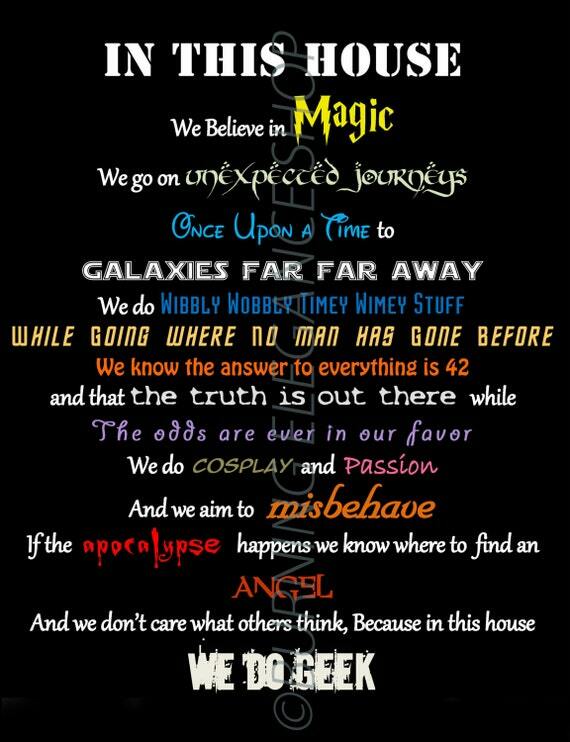 This would look great hanging in a nursery or a family room. This 16 x 20 inch sign is another great digital printable that can be printed at any photo print shop for a low cost. You get 3 different colors when you purchase this listing – black text on a white background, white text on a black background and white text on a brown background. 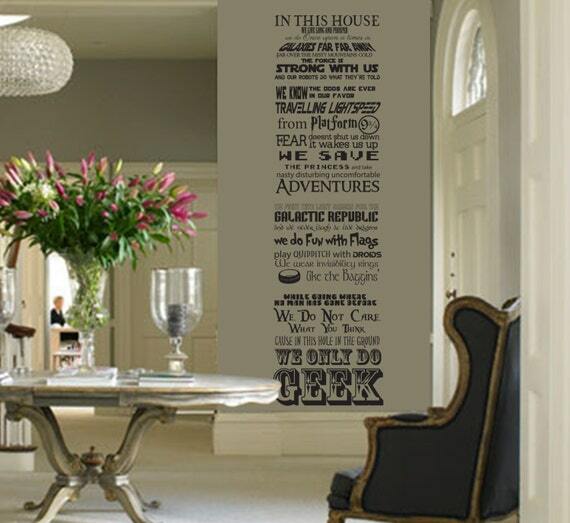 These extra-long vinyl wall decals are perfect for filling up space on a wall that is not very wide or a door. The decals are available in sizes ranging from 12 x 42 inches to 22 x 75 inches in your choice of one of 20 colors. 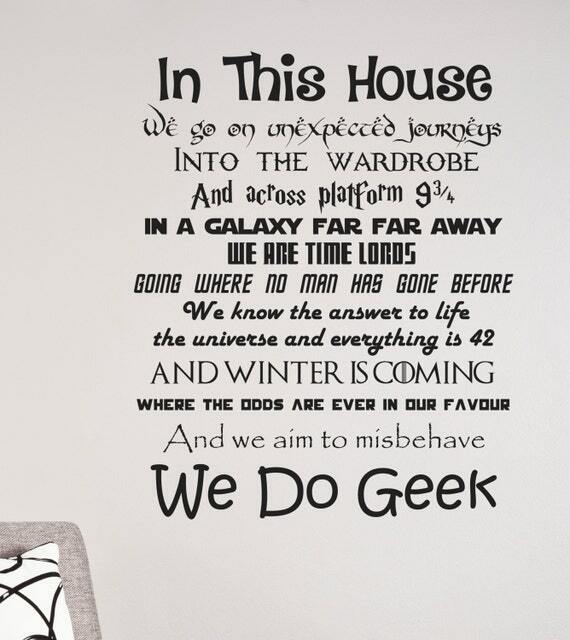 Fill up empty wall space with a nerdy 22 x 27 inch vinyl wall decal. This decal is available in a variety of 20 different colors to match any color scheme of room. The decals are easy to apply and remove and will not damage walls. Are you are a do-it-yourself person? Here is a cutting file for making your own signs. This is a digital file that you can use to create vinyl letters using Cricut and Silhouette software. This file comes with a personal or small business commercial license. While technically not a sign, here is a digital embroidery file for stitching the popular quote onto fabric or clothing using an embroidery machine. This file is designed to be stitched onto a 200 x 250 embroidery hoop or larger. 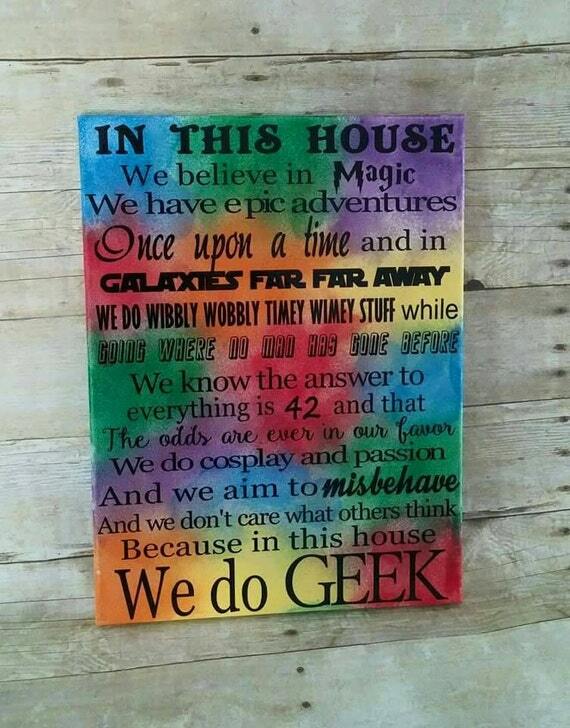 Thank you for visiting and I hope you enjoyed this collection of “In This House We Do Geek” signs!